This revival of Alan Bennett's 1968 comedy is full of fresh ideas while still remaining a nostalgic look back through the last century. As a fan of both Alan Bennett and Chichester Festival Theatre, the prospect of seeing Forty Years’ On was appealing before I’d even stepped foot inside the auditorium. Starring the legend that is Richard Wilson as the Headmaster, this marks the first production of Daniel Evans’ tenure as Artistic Director at Chichester. Evans found success as Artistic Director of Sheffield Theatres for seven years, including his critically acclaimed production of the classic musical Show Boat, which transferred from the Sheffield Crucible to the West End last year. It is therefore fair to say there were high expectations for this revival of Alan Bennett’s first West End play, a comedy centred around a headmaster who takes part in one last school production before he retires from a boys’ public school in 1968. Overall, these expectations were not dashed. 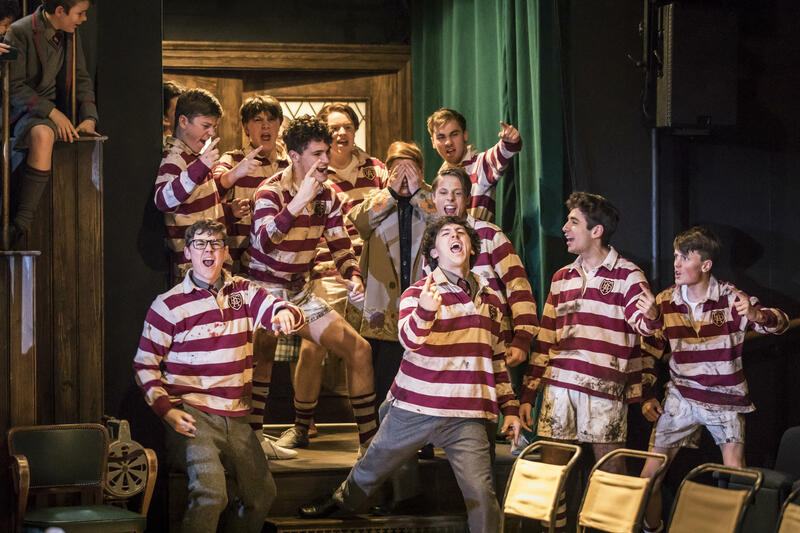 Employing a chorus of over 50 local boys, the play opened with a triumphant choral number which heralded Wilson’s strong entrance like a king; you felt simultaneously in awe and honoured to be in his presence. The use of this ensemble was incredibly effective, with well-synchronised vocal work and movement, and this was just one small part of what I shall call the Chichester twist. All of the productions I have seen at Chichester have featured plenty of showy musical numbers with fantastic dance routines. With Forty Years On being a play rather than a musical, I understandably did not expect to see any of this: and yet there it was. The transitions between scenes were seamless with the help of live music, mostly performed by the cluster of pupils played by adult actor-musicians. These breaks in between the scenes kept the action fresh and interesting, featuring charming and period-appropriate singing, excellent instrument work and even some tap dancing. The tap routines are always the highlight of Chichester productions for me and I was thrilled to see it worked into the play. Where acting was concerned, the adult cast were excellent both in their own rights and as support for Richard Wilson. Bennett’s witty humour in the script shone through with perfect comic timing on several occasions. Wilson himself was a powerful presence and fascinating to watch as a figure with immense experience and talent. Many critics have complained about the fact he was not always completely off-script and had a couple of stumbles around lines. However, when he did have to read the script, he did so off a podium which was completely in character. Moreover, the man is 80-years-old, and a couple of minor mishaps with lines are entirely forgivable when watching the performance because, well, he’s Richard Wilson! Overall, the performance was a delight to watch. The play-within-the-play, which took up the majority of stage time and jumped around between World War I and the end of World War II, provided some very poignant imagery. To compliment this, the present-day action of the play was humorous and energetic, and there was plenty of light relief. There were many links to be drawn to the modern day, with a look through time at the progress we have made and thus many questions raised about Brexit, war and refugees, to name a few. It was certainly hard-hitting to view images through the decades flashed before our eyes, and seeing the ways we have regressed in the past few years. Yet, although this made for a solemn ending, the play on the whole was entertaining and a joy to watch, whilst also leaving an impression on its audience. A brilliant start for what will hopefully be a long and successful career for Daniel Evans as Artistic Director at Chichester. Forty Years On is running at the Chichester Festival Theatre until 20 May. Check out an interview with the play’s star, Danny Lee Wynter, where he talks about working with Daniel Evans and more.